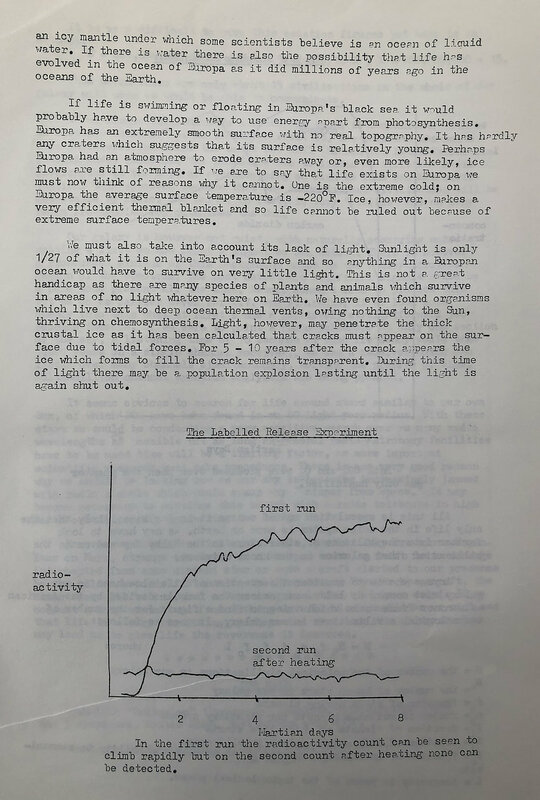 Back in 1984/85, when I was 17, I wrote some articles for ‘Stardust’, the journal of the Irish Astronomical Association. I’d totally forgotten about this until I found myself rifling through some boxes in the garage of my mother’s house and amazingly unearthed them! 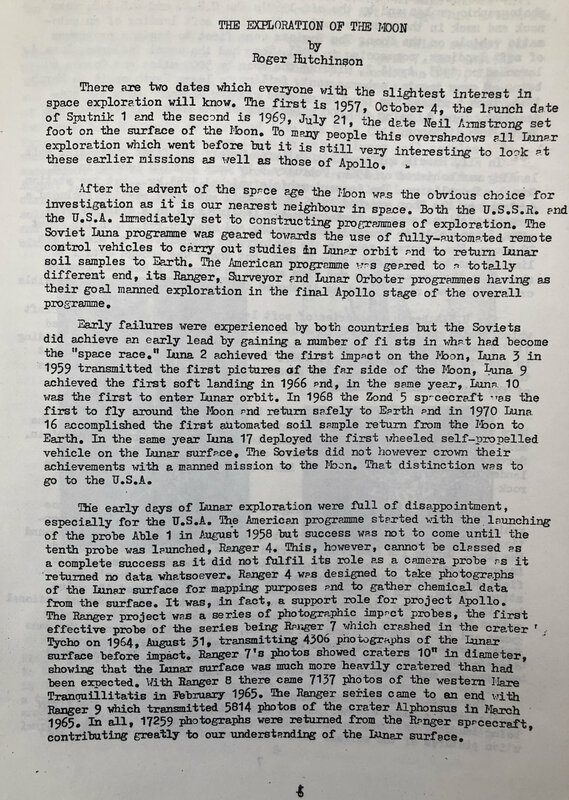 They need to be read through the lens of 35 years having passed, but I thought I’d reproduce scanned copies of the articles here for posterity. 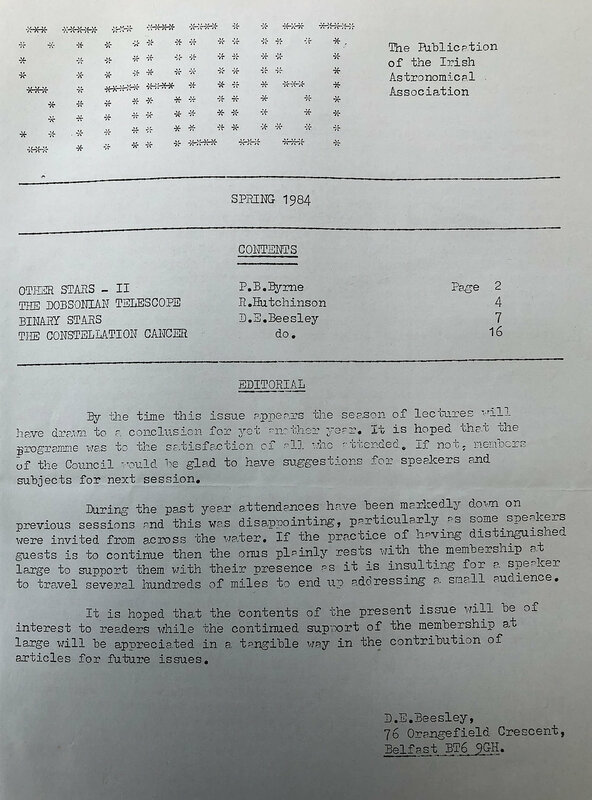 Subjects covered are lunar exploration, the search for extra-terrestrial life and building a Dobsonian telescope, enjoy! Venus is one of the most beautiful sights in the night sky, shining brightly as it hangs above the horizon at dawn or dusk. It is unquestionably a wonderful spectacle, but this low elevation presents a challenge for the astrophotographer as when an object is close to the horizon we are viewing it through a thick layer of atmosphere, conditions which rarely result in sharp images. The fact that Venus is an inner planet (orbiting between the Sun and the Earth) means that in our skies it never strays too far from the Sun resulting in a low elevation when viewed against a dark sky, especially when it is showing a dramatic large crescent phase. You might think this means you may as well give up on capturing decent images of our celestial evil twin but never fear, there are weapons in the astrophotography arsenal which mean we can image Venus when it is high in the daytime sky, even when at it’s closest to the Sun (inferior conjunction). In this post I’ll cover some of the techniques that hopefully will result in you producing images of Venus you will be proud of. One very important point to mention is that you should always exercise caution when using a telescope if the Sun is above the horizon. Always keep the lens/mirror cover on when slewing the scope and NEVER look through the eyepiece if there is even a small chance that the Sun may be in the field of view. The key to achieving a sharp image of Venus is to utilise the farthest regions of the visible spectrum and beyond as this will enable you to capture the planet whist the Sun is still above the horizon. The visible light spectrum is comprised of the following colours, detailed along with the wavelengths they occupy: - Red (625 – 740nm), Orange (590 – 625nm), Yellow (565 – 590nm), Green (520 – 565nm), Cyan (500 – 520nm), Blue (435 – 500nm) & Violet (380 – 435nm). As I’ve mentioned in previous posts longer wavelengths of light are less affected by atmospheric turbulence (seeing). I like to think of it in terms of a huge red oil tanker cutting through the waves whereas a small blue rowing boat would be bobbing around inducing sea-sickness in its occupants. The image through a red filter may be comparatively steady while the blue filter may produce an image that appears to ‘boil’ rapidly moving in and out of focus. Imaging in the near infra-red helps to combat poor seeing (within reason) and also has the added bonus of increasing the contrast between the sky and the object you are imaging, in this case Venus. As shown in the diagram above the normal visible spectral bandwidth is 400 – 700nm, I use a Baader IR Pass filter which blocks the transmission of any wavelength below 670nm (deep red), just inside the visible range, with a transmission peak at 685nm. One important point to note is that you will need to use a camera that does not have an IR Cut filter as this will block the wavelengths you are trying to capture! To the eye Venus appears a featureless white, but if you venture to the shorter wavelengths of the electromagnetic spectrum it is possible to tease out detail within the clouds that envelop the planet. For this I employ a Baader U-Filter (Venus and UV) which allows the bandwidths 320 – 380nm to pass, peaking at 350nm and completely blocking all other wavelengths in the spectral range 200 – 1120nm. Until relatively recently this type of filter was beyond the reach of most amateur astronomers due to their high cost, now they can be picked up for around £200, within the means of most dedicated planetary imagers. As with IR filters you need to ensure that your planetary camera is sensitive to the relevant wavelengths and as the image produced will be dim an aperture of 8” (~200mm) is recommended. It is also worth noting that some mirror coatings may affect transmission so it is worth doing a little research with respect to your particular setup prior to purchasing this type of filter. 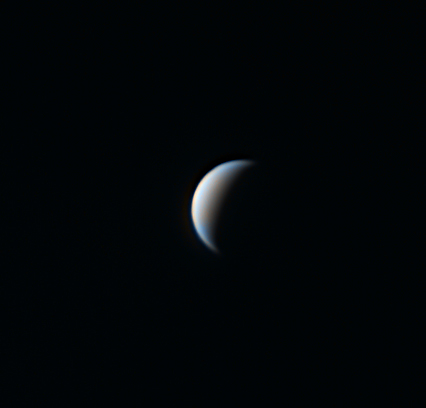 I’ve already gone into detail on the capture and processing of planetary images in a previous post (follow link here) so won’t repeat myself here, instead I’ll concentrate on the steps required to produce a false colour rendering of Venus using the processed images captured using the IR pass and UV filters I have described above. In Photoshop we will assign the image taken through the IR pass filter to the RED channel, the BLUE channel will use the UV filtered image, but what about GREEN? This channel will use a synthetic green comprising a 50/50 blend of the IR and UV images. The resulting Synthetic green channel image is shown below. RGB image constructed using the steps outlined above. As a final step you may wish to copy your IR image as a luminance layer onto your final IRSynGUV image, this will generally create a crisper, brighter result. You can adjust the opacity of the luminance layer to taste and also alter the levels, rotate the image etc.Once you have completed this you should end up with a result something like that shown below. Good luck and make sure you enjoy observing this beautiful planet. The problem with that question is the answer depends on where your interests lie, do you want to use it to image and/or observe the Sun, Moon and planets, the deep sky (stars, nebula, galaxies), or a little bit of everything? So it really pays to think about how you want to use your scope and the various options available to you before parting with your hard earned cash. Before we go any further it is probably worth briefly describing a little about the history and limitations of the various types of telescope available to the amateur astronomer. A refractor is probably what most people think of when asked to visualise a telescope, and was the first to be systematically employed for astronomy by Galileo Galilei in 1610. If you travel to Syon House just outside London you will see that Englishman Thomas Harriot could also claim some firsts, including being the first to use a refractor to record a telescopic observation of the Moon and sunspots. In simple terms the refractor focusses light via a bi-convex lens (the objective). You can see from the diagram below that a simple refractor does have a problem in that the glass used to make the objective lens has a refractive index which decreases as the wavelength of light increases. As a result of this if you move the focal plane to the point of blue focus you will see a sharp blue point of light surrounded by a red halo, moving the focal plane to the red point of focus will result in a sharp red point of light with a blue halo, this is called chromatic aberration. A compromise would be moving the focal plane to the ‘circle of least confusion’, but at this point nothing is properly in focus! Never fear, modern refractors shouldn’t suffer from chromatic aberration due to the efforts of English optician John Dollond (still on the UK high street as the opticians Dollond & Aitchison). He patented the achromat in 1758 which corrects chromatic aberration by using two lenses made of different materials (crown and flint glass). The crown glass converges the light & introduces chromatic aberration, the flint glass element has a refractive index which strongly affects blue light thus correcting the chromatic aberration. The addition of a third lens (triplet) will bring the green wavelength of light to the same focus as well, these are called apochromats (APOs) resulting in red, green and blue wavelengths all being brought to the same focus. Pretty much every astronomical refractor on the market today will be an APO but I think it is always useful to know what this actually means. Addition of further lenses will offer benefits such as field flattening (round stars at the edge of the field of view) or focal length reduction. Refractors are generally stable against temperature changes over the course of a night as the expansion and contraction of the front and back surfaces of the lens tend to cancel each other out. High quality lenses are much more difficult and expensive to manufacture than mirrors so if you want an aperture comparable with even the smallest of reflecting telescopes it will come with quite a high price tag. Traditional refractors tend to have quite a long focal length meaning that the image is spread over a large area of the focal plane effectively dimming the image, however refractors with short focal lengths (‘fast’) are available and there are some reasonably priced, good quality fast refractors on the market. Reflecting telescopes, as the name suggests, use mirrors to collect and focus light and so are free from chromatic aberration. This doesn’t mean that reflectors are problem free, with a spherical mirror (the mirror being a section of a sphere) light rays from the edge of the mirror achieve focus nearer the mirror than those from the centre. This causes blurring known as spherical aberration. You may have heard that term before as this is what plagued the Hubble Space Telescope before the shuttle mission to repair it. Spherical aberration is eliminated by using a parabolic mirror where the reflected light achieves focus at the same point. In the section on refractors you may recall I mentioned field flattening, this corrects yet another aberration called off-axis aberration where objects at the edge of the field of view suffer from various types of distortion, coma being the one that causes the most angst. At the centre of the field your stars may be sharp points but at the edge they may appear distorted and comet like (hence the name). Field curvature is also a common issue where the best focus lies on a curved plane resulting in the stars at the edge being blurred, field flattening lenses are employed to correct this issue. I’ll touch upon how these problems have been addressed in the various designs available. Newtonian – Isaac Newton is credited with making the first reflecting telescope in 1668 coming up with the eponymous design shown in the diagram below. The telescope consists of two mirrors, the primary which is a concave parabola and the secondary which is flat. The primary collects the light and the secondary, inclined at an angle of 45 degrees, directs it so that the point of focus is to the side of the primary mirror. This design still works well for small amateur scopes but for larger scopes this configuration becomes impractical. Cassegrain - Hot on the heals of Newton in 1672 Laurent Cassegrain developed the design which carries his name. The primary mirror is the same as in the Newtonian design but the secondary, rather than being flat is convex. This reflects the light back to the centre of the primary where it then passes through a hole and comes to focus just behind it. This has the benefit of enabling instrumentation to be fitted without the balance problems of a Newtonian design and delivers long focal lengths without the corresponding increase in the length of the optical tube. Ritchey-Chretien - Remember off-axis aberrations? The Newtonian and Cassegrain designs both suffer from coma so to rectify this George Ritchey and Henri Chretien jointly developed the Ritchey-Chretien telescope in the early 1900s. This is basically a modified Cassegrain with a concave hyperbolic primary and concave hyperbolic secondary, removing spherical aberration and coma and reducing the effects of field curvature. The payoff is that the secondary mirror is larger and covers some of the primary but imaging performance over a wide field of view is much improved on the Newtonian or Cassegrain designs. For the amateur they do tend to be expensive due to the increased complexity of producing hyperbolic mirrors. You don’t have to limit yourself to only using mirrors or lenses, you can of course combine the two in what is known as a catadioptric telescope. Three of the most common are the Schmidt, Maksutov-Cassegrain and Schmidt-Cassegrain. Schmidt –Also known as the Schmidt Camera, was designed to image large fields of view. A spherical primary mirror receives its light through a thin aspherical lens (corrector plate) which compensates for spherical aberrations. The spherical mirror means that this design is free from astigmatism. Maksutov-Cassegrain – This design combines a spherical mirror with a weakly negative meniscus lens or corrector plate which corrects the problems of off-axis and chromatic aberration. Patented in 1941 by Russian optician Dmitri Dmitrievich Maksutov it is based on the Schmidt camera and uses the spherical errors of a negative lens to correct the errors of the spherical primary mirror. In the Cassegrain version there is an integrated secondary using all spherical elements, simplifying the build and making this design cheap to manufacture. A 127mm ‘Mak’ makes a great first telescope. Schmidt-Cassegrain - As the name suggests this is a hybrid of the Schmidt and Cassegrain designs. The big advantage of this design for the amateur astronomer is that it is cheap to mass produce as it uses spherical mirrors, spherical aberration being dealt with by a corrector plate. This design does suffer from off-axis aberrations as the corrector lens is not placed at the centre of curvature, this is corrected for in more expensive models of Schmidt-Cassegrain such as Celestron’s Edge HD range. This design delivers a long focal length in a short tube resulting in a powerful, compact and portable scope. The focal ratio is typically f/10 and they come in a range of apertures up to around 14” (356mm). There is a practical upper limit of around 16” (406mm) as manufacture of a corrector for larger apertures is costly and can suffer from flexure making it impractical to go much larger with this design. Reflectors and catadioptric telescopes deliver much greater apertures and hence light gathering power than refractors in a similar price range. The compact design of Schmidt-Cassegrain and Maksutov-Cassegrain scopes deliver long focal lengths in a small package (for smaller aperture scopes). Anything up to an 8” scope (203mm) will be easy to handle and transport and the smaller 5” (127mm) ‘Maks’ can fit in a small (ish) bag while delivering typical focal lengths of 1500mm. They can suffer from changes in temperature through the course of an observing session so you need to be mindful that focus may shift. Newtonian and truss designs are not sealed units so suffer from collimation issues. You will have to learn how to collimate your scope to achieve the best results. 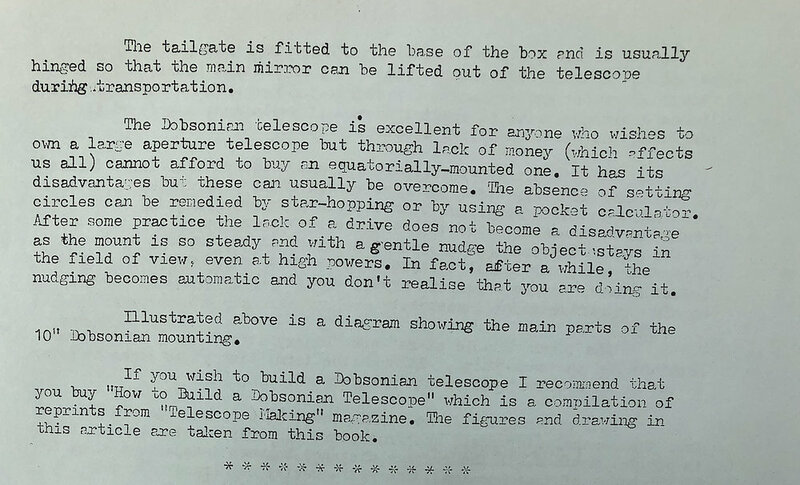 Collimation will also have to be performed on Schmidt-Cassegrains but if you are not transporting it regularly this will not be as much of an issue as with a Newtonian for example. The good news is collimation should not be an issue with Maksutov-Cassegrain scopes. They can be large and cumbersome, especially the Newtonian design where the focal length of the scope is reflected in its length rather than being folded as in the Cassegrain design. Of course you aren’t just going to buy a telescope, you are also going to be buying something for it to sit on so think about whether you will primarily use your scope for visual observing or want to try your hand at astrophotography. This is important as it will have a bearing on the type of mount you will require. For the beginner in visual astronomy and astrophotography I would recommend a driven ‘Go-To’ mount. Once properly aligned all you will need to do is select the target you want to observe on the hand controller, or in some cases via an app. This is particularly useful in urban locations as often you simply can’t see the stars required to star-hop to an object, and anyway this is a tricky skill to learn when just setting out. There are some bargains to be had if you go down the un-driven route with ‘Dobsonian’ scopes offering large aperture at relatively low prices but I would leave these until you are more familiar with the sky and have established where your interests lie. It can be a frustrating activity trying to find an object and keep it in view at high magnification! If you are a visual observer or are just planning on shooting the Sun, Moon or planets then you should be able to get away with a simple alt-azimuth driven mount. These track the object you have selected in two axes in a kind of stepping motion so your target will always stay in view, but this won’t be suitable for long exposure photography. For long exposures you will require a sturdy, polar aligned equatorial mount. This tracks in one axis meaning that the scope will smoothly track your chosen object from east to west. Equatorial mounts are more complex to set up and align and are normally much heavier than a simple ‘Alt-Az’ so if you think this may be a problem for you start off with the simpler Alt-Azimuth mount. You can always purchase an equatorial mount later as your interest develops while retaining your scope. The primary consideration when photographing or observing the Sun, Moon or planets is image scale, you want your scope to deliver high magnification so a long focal length is required. Traditionally the recommendation would have been a long focal length refractor but these are expensive, or if cheap low quality so I would recommend a Schmidt-Cassegrain or Matsukov-Cassegrain design. Go for the largest aperture you can afford in your price range as at long focal lengths light gathering power and resolution is important. If you go for an 8” scope you’ll find this should serve you well for years. If your interests are in observing star clusters, galaxies such as The Andromeda Galaxy M31 or the Orion Nebula M42 then high magnification is not what you are after. Here a fast refractor will produce beautiful wide field views and a small objective lens should not be a problem. A lot of people don’t appreciate the size of many deep sky objects, M31 covers an area of over 3 degrees, that’s 6 full Moon widths so you need a wide field of view to fit it in! A 65mm f/6 refractor will provide you with lovely wide field views and will also enable you to take beautiful images when coupled with a camera and the right mount. When looking at potential purchases bear in mind the issues mentioned in the refractor section of this post. You want to make sure it is an APO and if possible also delivers a flat field giving you round stars right to the edge of the field of view. It’s likely that if you are just starting out you won’t know exactly where your interests lie. If this is the case I would lean towards a scope that is going to deliver good views of the Sun (with a suitable filter), Moon and Planets while also enabling you to view brighter deep sky objects such as open and globular clusters. A 5” (127mm) or 6” (152mm) Schmidt-Cassegrain or Maksutov design will serve as a good all-rounder, delivering reasonable aperture and focal length. First you need to know how to calculate the magnification your eyepiece will deliver. All you need to do is work out the focal length of your scope by multiplying the aperture in mm by the focal ratio, so a scope with a 203mm aperture and focal ratio of f/10 will have a focal length of 2030mm. The magnification provided by your eyepiece is calculated by dividing the focal length of the telescope by the focal length of the eyepiece, so a 25mm eyepiece will deliver a magnification of 2030/25 = 81 a magnification of 81 times (81x). Typically a telescope will be supplied with a 25mm eyepiece, you may want to supplement this with a 9mm for higher magnification or invest in a Barlow lens or Powermate. These will effectively increase the focal length of you scope by a stated amount, e.g. 2.5x , so your 2030mm scope will deliver an effective focal length of 5075mm with a 2.5x Barlow or Powermate, with a 25mm eyepiece delivering a magnification of 203x. Barlows and Powermates are especially useful for high resolution planetary, lunar and solar imaging, so if you think this is going to be your thing then I would recommend investing in one. Generally the eyepieces supplied with cheaper telescopes will not be of great quality but will suffice when starting out. If you do decide the hobby is for you it makes sense to upgrade to a more expensive model at some stage. Don’t run before you can walk. Start small while you dip your toes in the water, if you get the astronomy bug there’s plenty time to upgrade as your skills develop. The best scope for you is the one you will use. Don’t choose something that is heavy or difficult to transport and set up. You’ll end up cursing it and coming up with excuses not to spend a night under the stars. For planetary, lunar and solar observing and imaging you need a long focal length. If you want to observe or photograph the deep sky a short focal length is best, ideally coupled with a large aperture. If you want to take long exposures you’ll need an equatorial mount. If you are still unsure about what you should buy you could go for a pair of binoculars. A pair of 10x50s will give great wide-field views, are relatively cheap, easily transportable and can be used for other things if you decide astronomy isn’t your thing after all. In a previous post I detailed how to capture and process high resolution planetary images, but what if you want to do something a little different with that hard earned data? A planetary animation is a really fun way of presenting your images and isn’t as hard to achieve as you might think, though it does require a little perseverance. The workflow is shown below and described in the remainder of this post. In my guide to planetary imaging and processing previously posted on this site I cover planetary rotation periods and the challenges they present in the capture of high resolution images. When creating planetary animations high rotation rates are no longer your enemy, but your friend. To gain the best results we want to choose a planet with a fast rotation period and clear surface features, basically Mars and Jupiter. All the other planets either rotate too slowly or do not have enough surface detail to enable movement to be tracked by the eye. One possible exception is Venus, where if you are shooting through IR and UV filters you may be able to show some movement of the cloud layers high in the Venusian atmosphere. How Many Frames Should I Shoot? From my planetary imaging post you will see that Mars has a rotation period of 24.6 hours and Jupiter one of 9.9 hours. 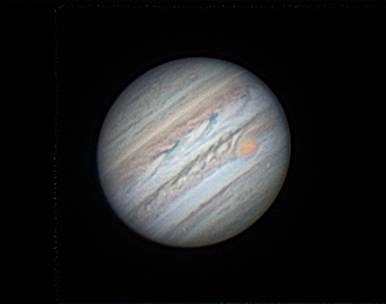 If shooting Jupiter over a 4 ½ hour period you will be able to capture half a rotation of the planet, and if you time your captures with ingress and egress of the Great Red Spot you will have all the makings of a striking animation. I have found the website Calsky really useful in planning this type of project (www.calsky.com), choose planets from the top menu, then choose the planet you are interested in and then ‘Apparent View Data’, you can then play with the dates and time to see what your best window of opportunity is. The time of year you will be imaging is also a factor as you will need enough hours of darkness to capture all your frames, something that is a bit of a challenge here in the northern hemisphere as Mars and Jupiter both reach their best at a time when darkness is at a premium! With Jupiter video shot over a period of as little as 30 minutes will still produce a nice result, so you don't have to go the full 4 1/2 hours! The method you need to employ to capture your images is described in my guide to planetary imaging and processing, the difference being you will be taking a lot more shots of the same target. Say you aim to capture an image every 5 minutes, if you shoot using a colour camera or through one filter with a mono camera (IR or Red) you will end up with 12 images an hour which will yield 55 images over a 4 ½ hour period. If you wanted to produce a colour rotation video with a mono camera you would end up with 4 times that number of videos to process, a hard drive busting 220 videos! So I stick to mono through one filter, but you may be more dedicated than me! In WinJupos create an image measurement (IM) file for each of the processed images and de-rotate each individual IM file, you should now have 55 WinJupos generated images (for 4 1/2 hours worth of data) . Now load each contiguous pair of IM files and de-rotate them e.g. load timestamp 00:00:00 & 00:05:00 the result will be the mid-point between the two, if you do this for each adjacent pair you will end up with 54 extra images to add to your rotation video. Almost double what you started with! Now you have a healthy 109 images to make up your rotation video with an effective gap of 2 ½ minutes between each frame which should yield a lovely smooth result. Once all the images making up the rotation video have been generated and further sharpened it is a good idea to open each adjacent frame up side by side in PhotoShop and check that there are no large variations in levels etc. as this will affect the quality of your final animation. Try to make each adjacent frame as consistent as possible, tedious but well worth it in the end. Here I'll discuss how to generate your animation using the free software Planetary Imaging PreProcessor (PIPP - https://sites.google.com/site/astropipp/). There are lots of animation applications out there, for example, you can use PhotoShop to create a frame animation, or WinJupos to create an animation using a surface map pasted onto a sphere. Both these methods can yield great results but I'll limit myself to PIPP for now. On opening PIPP you will see a number of tabs I'll go through the relevant ones in order. Source Files - This tab is defaulted when you open the application. Here you need to click [Add Image Files] and select the frames you want to use for your animation. Make sure they are loaded in order, if they are timestamped they will automatically load in the correct sequence, otherwise you may need to make sure the start frame is at the top of the list and the last frame at the end with all intervening frames in the correct order. Once you've opened your images a pop up will inform you that join mode has been selected, this is what you want so just OK the message. Make sure the Planetary Animation box is ticked, this will optimise the settings in the other tabs automatically. Processing Options - The selections in this tab will be defaulted to those the software determines as optimal for planetary animation, however you may want to alter some of these. I've found that the object detection threshold may need to be amended if your images are quite dim, I also find that it is worthwhile enabling cropping so that you don't end up with a lots of blank space around your subject. There are handy 'test options' buttons which enable you to check that the options you have selected provide the desired result, if not just tweak them until they do. Animation Options - Here you can select how you want your frames to be played i.e. forwards, backwards, number of repeats, delay between repeats etc. Don't make the delay too long, just enough to show it is cycling through the images again is what you want. Output Options - In this tab you can choose where you want your animation to be saved, the output format, quality and the playback frames per second. I've found that 10 frames per second gives a nice result, so aim for that if you have enough images, if you have a large number of input images you can go even higher - the higher the frames per second the smoother the final result. You can save as an AVI or GIF. I tend to save my animation as an AVI and convert it to a GIF in Photoshop, I describe how you do this in a later section of this post. Do Processing - Once you are happy with the settings you have chosen go to the Do Processing tab and click [Start Processing]. The AVI or GIF will then be generated and saved to the location you specified in the output options tab. If you get a processing error where the object has not been detected just go back and change your object detection threshold and try again. Your planetary animation should now ready to enjoy and share! While you can save your output as a .GIF in PIPP I tend to do this as an additional step in PhotoShop, its not essential but I find it gives a slightly better result. If you don't have PhotoShop or are happy with the output from PIPP then you don't need to perform this step, if you do want to try it here's what you need to do. When the options box below appears ensure 'Make Frame Animation' is checked. You can also choose whether you want to limit the frames processed, though generally for planetary animations you would want all frames. You can choose various options from the menus within the GIF screen presented, generally I just set the noise settings as shown. In these days of smartphones and sophisticated DSLRs it has never been easier to capture images of the Moon or planets by placing your phone camera at the eyepiece or attaching a DSLR to the back of your scope and shooting video or taking a photo. The results can be pretty impressive, but what if you want to capture the planets in more detail? This is a much more involved process which I’ve summarised in the chart below, hopefully you won’t find this too intimidating, but even if you do read on and I’ll attempt to guide you through the steps needed to produce your own detailed images of the planets. 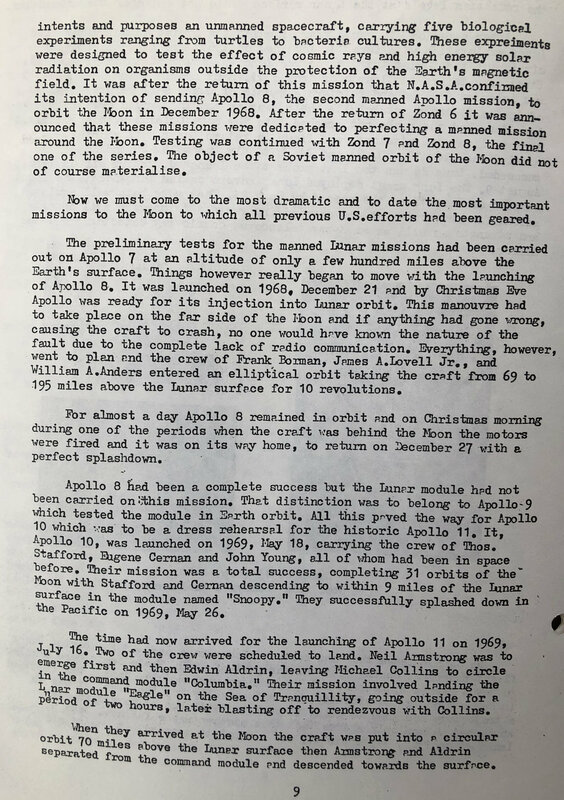 I’ve covered the importance of seeing, focus and image scale in an earlier post - High Resolution imaging of the Moon (http://www.thelondonastronomer.com/it-is-rocket-science/2018/4/12/high-resolution-imaging-of-the-moon), so won’t restate the criticality of these factors here. This section covers what I believe are the key points to consider regarding camera settings and capture duration, assuming that you are imaging at the longer focal lengths required for high resolution planetary photography. Just as the Earth rotates on its axis, so do the other planets in our Solar System, some faster and some much slower. This rotation can have a significant effect on the sharpness of your images as features will smear when stacked due to their movement over the capture period, the longer the duration of your capture video the worse it will be. This blurring can be mitigated by using software such as WinJupos and AutoStakkert (which I will cover in detail later), but I try to keep my ‘sub-captures’ within the limits detailed below, and the overall capture period (remember we are taking multiple sets of data) in the case of Jupiter to around 30 minutes to reduce blurring around the limbs of the planet. The actual theoretical maximum capture time you can get away with without blurring will depend on the pixel size of your camera and the focal length of your telescope so timings will vary. I’ve given some suggestions below to act as a starting point but these are only suggestions, it definitely pays to experiment with your own set up. The times I’ve given also take into consideration the fact that we are adding the time taken to capture through each of the 4 filters together, though each suggestion is for an individual filter run. I aim to shoot around 5 sets of IR, R, G, B data, as a general rule the more data sets you have the better so this is not a hard and fast limit. I try to keep my imaging runs within a reasonable time frame to reduce limb blurring, as mentioned earlier, but if you are shooting with a colour camera, or your target rotates slowly you can get away with a lot more, its then about your level of desire to process large amounts of data! Mercury – Rotational period 58.6 days. No practical limit to length of captures or number of datasets. Generally you only need IR as you will not be looking to bring out colour but rather attempting to show phases and surface detail, you will however need lots of IR captures for stacking. Venus - Rotational period 243 days. No practical limit to length of captures, however if imaging cloud structures in UV you may want to restrict to a few minutes especially as image brightness tends to be quite dim in this wavelength. In other wavelengths Venus is so bright that time limit shouldn’t be a factor anyway. Generally IR will suffice and if you want to reveal cloud structures IR & UV. Mars - Rotational period 24.6 hrs. Time will vary with the apparent size of Mars as it presents very differently when it is at opposition compared to when it is further away from us on its journey around the Sun. At opposition I would suggest limiting each capture to a maximum of 90 seconds. Jupiter - Rotational period 9.9 hrs. Try to keep individual captures below 60 seconds, preferably around 45 seconds. As Jupiter presents as a bright target in IR, red, green and blue wavelengths you should still be able to capture a large number of frames at a reasonable frame rate within these limits. Saturn - Rotational period 10.6 hrs. Saturn has a lower surface brightness than Jupiter when imaging at long focal lengths so exposure times will have to be longer resulting in it taking more time to capture a decent number of frames. I’d suggest limiting capture times to 120 seconds if conditions allow. Uranus - Rotational period 17.9 hrs. Unless you are imaging at a very long focal length with a large scope it is unlikely that you will be lucky enough to capture detail within the atmosphere of Uranus so rotation limits are pretty academic. Also the planet will present as a small dim target so you will be imaging at high gain. In this case the more frames the better. Neptune – Rotational period 19.1 hrs. See advice for Uranus. I can’t give any hard and fast rules here as the optimal settings will depend on your individual camera and scope, however I can give a few general pointers from my own experience. I aim to capture around 3000 frames through each filter, within the time constraints detailed above, so I try to take this into account when setting exposure and gain. You will want to be shooting at around 60 frames per second for a target like Jupiter, though this may have to drop lower for targets like Saturn (~ 30 fps) or the outer planets (~10 fps). Capture Area - The capture area selected will have a big impact on frame rate, fortunately (or unfortunately depending on your point of view) a planet will present a small image on your camera chip so you can get away with only using a small proportion of it, usually 640 x 480 or 800 x 600 pixels. Gain – Gain can be compared to the ISO setting on your digital camera, the higher the gain or ISO the more electronic noise there will be in your images. When imaging bright objects you can get away with lowering the gain which will give a cleaner image from a smaller stack. If your target has a dim surface brightness then you probably won’t have any option but to shoot at high gain as increasing exposure time may not be an option with respect to maintaining a decent framerate. When shooting at high gain you will want to shoot as many frames as you can, within the constraints already mentioned, to counteract image noise by stacking. Gamma - Within SharpCap I keep the Gamma setting at 50 which is the recommendation for planetary imaging with ZWO cameras, you may want to check any manufacturer specific advice for your own planetary camera . In my experience gamma is only a consideration when shooting targets with extremely high contrast variations such as the ISS. File Naming – Most image acquisition software, certainly SharpCap and FireCapture, enable you to automatically name your videos in a format that is recognisable by WinJupos i.e. the date and time of the capture is in the file name. Make sure you enable this as it will make your life much easier later on. Now you’ve completed your five IR, R, G, B imaging runs and are the proud possessor of twenty .AVI or .SER video files you need to process them, starting with stacking each of the videos. You’ll repeat this process 20 times, once for each video (OK some elements of this workflow are a little tedious). With twenty individual videos to process it can be very easy to get yourself into a total mess regarding where you have got to in the workflow so the first thing I do is create a sub-folder for each of the IR, Red, Green and Blue datasets. By doing this I can process them independently and go off and to other things without losing my place, bringing them back together later in the workflow. For stacking I use the free application AutoStakkert! (https://www.autostakkert.com/wp/download/). It really is hard to beat in terms of the quality of the stack it produces, so I’ll briefly take you through the main things you need to know about its use. There are nuances depending on the target which I’ll try to cover when relevant. Quality estimator should be set to Gradient except for Mercury, Venus or Mars (when not at opposition) and a phase is shown. When Edge is selected a disk with check boxes around it will appear, simply uncheck the boxes on the unlit portion of the planet. Ensure the local radio button is checked, this estimates quality around each alignment point. With these settings click [Analyse] which will estimate the quality of each of the frames in your capture video. Once analysis has completed a Quality Graph will be shown. The grey line shows the quality of the unsorted frames and the green line the distribution of the quality sorted frames. The frame view window will also have sorted the frames from best to worst. My advice is to not bother with anything below the 50% quality line, the percentage of the remainder you may want to stack is really down to how noisy your individual frames are, it also pays to check visually each frame you intend to stack as this will give you a good idea of the quality of the final result. After checking quality enter the number of frames you wish to stack or the percentage and choose the format of the output file, I generally select TIF. Now you’ve chosen the percentage of your video you want to stack you will need to place your alignment points (APs). It is best to place APs in areas of high contrast in at least two perpendicular directions; these can be quite large (48 pixels for Jupiter). Smaller alignment points can be used in areas you really want to bring out such as the great red spot on Jupiter, the rings of Saturn or the polar caps of Mars (24 pixels), these can be placed on top of larger APs. Make sure you don’t place APs too close to the edge of the planet you are processing as this will cause issues with your final stack. You can also automatically place alignment points, choose the size and minimum brightness and let AutoStakkert! do the work, you may need to play with the minimum brightness setting to ensure that the alignment points aren’t placed to close to the planets limb. Now all you have to do is click [Stack], make sure Save in Folders is checked, leave normalise stack at 75%. AutoStakkert will then stack the image and save in a sub-folder within the directory you selected your video from, named according to the frame number or percentage selected earlier. All you now have to do is repeat this 20 times, then you can go on to sharpening. Now you have a set of stacked images you will need to apply sharpening to magically bring out the hidden detail. For this I use another free application, Registax (you can also stack in Registax but I think AutoStakkert! does a better job). When you open Registax (https://www.astronomie.be/registax/) choose [Select] and open your stacked image from the directory AutoStakkert saved it in, Registax will automatically open the Wavelets tab. Wavelets are a bit of a dark art and possibly the source of most of the questions that arise in planetary processing message boards. The problem is there isn't a magic scheme that you can apply which will work for all your images so no one can give a definitive recommendation, however the scheme shown in the image above works pretty well for good quality data. Many advise not to go beyond the first few sliders but I have found that with use of the denoise functionality you can make use of them all. The advice I would give is experiment with what works best for the data you are processing and it is better to be conservative with your processing rather than be too aggressive as this can make the result look artificial and introduce artefacts. Also you can try using linked wavelets of which there is a good description on the Registax website as well as guidance on other aspects of the application. A useful feature is the ability to save a scheme, if you find one that works well you can save it and use it as a starting point for other images, a real time saver. Once you are happy with the results of applying wavelets hit [Do All] and [Save], I create a 'Processed' directory as a sub-directory of the stacking directory created by AutoStakkert and save them there. You will need to repeat this process for each of the stacked files, so twenty times for a five set IR, R, G, B run, this is where 'Save Scheme' is worth its weight in gold! Once you've done this you can de-rotate your sharpened images. If you can recall the start of this post you'll remember that the planets rotate just as the Earth does, and this rotation will be apparent over the duration of your imaging run. Never fear this step will take care of that. Here we will use another free application called WinJupos (http://www.grischa-hahn.homepage.t-online.de/winjupos_download.htm). It can look a little daunting but in fact is relatively easy to use. When you initially open the application choose [Program] [Celestial Body] from the menu and make sure the target you have imaged is checked. Now choose [Recording] [Image measurement...], in the [Imag.] tab you will need to enter the longitude and latitude from which you shot the images, you should be able to get this from the compass app on your phone. Click [Open image F7] and the sharpened image you have chosen will open, it is important that you saved your image files with a time and date stamp, if this is in WinJupos format it will automatically populate, otherwise you will have to enter them in the Date & UT fields. Now go back to the Imag tab and click [Save F2], choose the directory you want to save the image measurement file in, I save to the directory of the wavelength I am processing , in the case of red I would save in the Red sub-directory. Once all twenty stacked and sharpened images have gone through image measurement create a de-rotated image for each colour channel, selecting all five of the image measurement files you have created in the previous step [Tools] [De-rotation of images]. You will select the five image measurement files created for the colour channel you are processing, as shown below. If you have done a previous de-rotation you will have to de-select the previously processed files. Now click [Compile Image F12] [Save F2], making sure the image is saved in the desired directory. Now you have a de-rotated RGB image comprising of your processed red, green and blue images. You can now apply even more sharpening in Registax if you think your image can handle it. You're almost there, from the initial twenty images you are down to two, one RGB image and an IR image. I open these in Photoshop and make any adjustments to levels, curves and colour as well as perform a little gentle sharpening if needed. I then apply the IR image as a luminance layer to the RGB image and adjust opacity etc as necessary. Congratulations, you've lasted the course and are now a fully fledged planetary photographer! As with all aspects of astrophotography there are many ways of achieving the same end, so please experiment, but hopefully this will have helped get you started. I often get asked about how I capture some of the images shown here on my website, especially the processes around capturing high resolution images of the Moon. In this post I’ll attempt to cover what I think are the most important or useful tips, hopefully getting you on the road to producing your own high resolution photos of our nearest neighbour. Many of the points covered also apply to imaging planets and the Sun, topics I plan to cover at a later date. In short the more the stars twinkle the worse the seeing is, it may be a beautifully dark and clear night but if the stars are shimmering away then you may as well forget about high resolution imaging. The effects of poor seeing are even more apparent through a telescope where it can appear as if the lunar surface is situated at the bottom of a very agitated swimming pool! You can counteract some of the effects of poor seeing by using filters that allow only the longer wavelengths of light to pass onto the camera chip, typically IR pass and red filters (covered later). It also makes sense not to try to image over rooftops in winter or hard surfaces in the summer, the radiated heat causing turbulence, so try to find a spot overlooking fields or a park. If the seeing is very poor just wait for conditions to improve and enjoy the twinkling stars. As well as using your eyes there are a number of websites that will give a good indication of what seeing conditions you are likely to encounter, a useful tool for planning whether it is worthwhile venturing out for the night. I’ve listed a few below but there are lots more that a simple google search should throw up. Even when the seeing is good the position of the Moon in the sky is also going to have an effect on the quality of your images. When the Moon is low to the horizon it's light has to pass through a greater thickness of atmosphere which causes the same sort of problems as poor seeing. For best results wait until the Moon is at its highest point (during darkness) and shoot then. In the summer months this can still be quite low so the best lunar images tend to be shot in the winter time, apart from when the Moon is a slim crescent when spring and autumn is best as the ecliptic is at its steepest. What you image is of course a matter of personal taste, however, anyone who has ever looked up when the Moon is out will appreciate that it is a dynamic object, its appearance changing as the Sun illuminates its surface over the monthly Lunar cycle. The best time to image depends on whether the target you have chosen is a crater or mountain range, a sea or ray structures. If you want to image a crater or one of the beautiful lunar mountain ranges then it is best to wait until your target is near the terminator (the line between light and dark). The shadows cast will bring the features into sharp relief and best show off their structure. Ray structures such as those around the craters Copernicus, Kepler and Tycho are best imaged under full illumination, so wait until the period around the full Moon before tackling these targets. It is also fun to try to image features near the Lunar poles, especially the heavily cratered south. The foreshortening caused by their position really helps to create a sense of depth to the image, giving the impression of flying over the surface of the Moon. 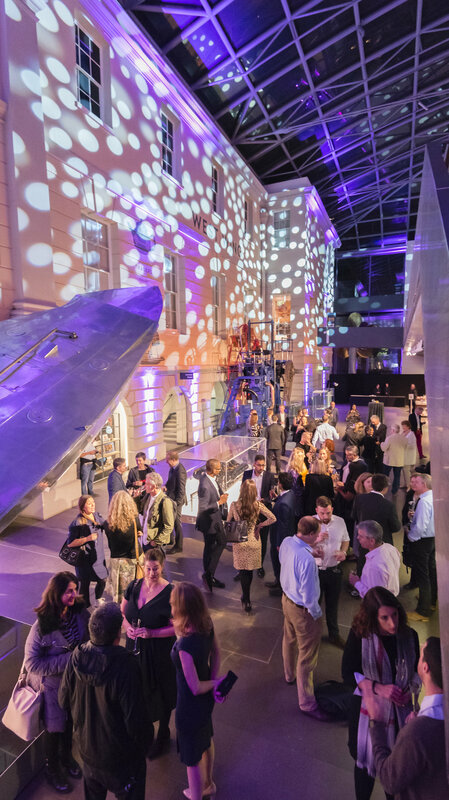 Apps are great for choosing when to image and what will look its best on your chosen night. I’ve found ‘Moon Globe’ to be especially useful and would recommend it. For high resolution imaging a simple rule applies, the longer the focal length the better (within the limits of your local conditions of course). The issue with imaging at long focal lengths is that the light from your target is dimmed so good light gathering power is also preferable; a large aperture telescope will produce better results than a smaller aperture instrument. Even if you have a wide aperture scope with a long focal length it is still unlikely that this will be enough for high resolution imaging, this means you’ll need to employ some form of image amplification via a Barlow lens or Powermate. I use a Televue Powermate and have found the 2.5x (increases your scopes focal length by 2 ½ times) version the best for my set up. This equates to an effective focal length of 7000mm when imaging using my Celestron Edge HD11 scope. At these focal lengths you will also need a good sturdy mount with good tracking as a highly magnified image will quickly slip out of your field of view if alignment and tracking is poor. It is also worth mentioning collimation as poor collimation will drastically reduce the quality of your images, you can have a big expensive scope but if it is badly collimated your results will be disappointing. If you have a refractor this shouldn't be an issue, if you have a Newtonian reflector it is likely you will need to re-collimate regularly, less so with Schmidt-Cassegrain scopes. Poor collimation results from improper alignment of the mirrors of the telescope, so in order for light to be properly focused in your eyepiece or camera your primary and secondary mirrors need to be properly aligned. How you collimate depends on your scope so I won’t go into details here but there are lots of resources on the web that will take you through the process. For high resolution imaging it isn’t a case of pointing and shooting a single image as you would when taking a selfie or snapping something on holiday. To create a high resolution image we need to shoot a video (.AVI or .SER) which we then process into a single stacked and sharpened image (more later). For best results you should use a high frame rate planetary camera with a sensitive chip. The choice between a colour camera or a mono (black and white) camera is down to how much time and effort you want to spend imaging but I would always recommend using a mono camera as this will produce the best results in terms of image quality and resolution, the whole pixel being used to collect data rather than being shared across a number of colour filters. You can still take colour images with mono cameras, all you have to do is image your target through red, green and blue filters and combine them in image processing software to create the combined colour image. This is however somewhat redundant in the case of the Moon as a grey-scale image pretty accurately represents what the eye sees anyway. In terms of the make and model of camera I would recommend those made by ZWO, I use a ZWO ASI174MM camera and have owned a ASI120MM in the past, these are brilliant little cameras and competitively priced. It is worth noting that you can also shoot video using a DSLR camera but as I have no experience of this for high res lunar imaging I'll leave that to others more qualified to discuss. Filters are a great way to counteract the affects of poor seeing. For lunar imaging I use a Baader 685nm IR pass filter which really helps to improve image quality, a similar effect can be achieved by employing a red filter. IR filters do create a dimmer image (hence a large aperture being preferable) , a red filter will produce a brighter image which may enable you to image at a higher frame rate without having to increase gain which introduces noise. The atmosphere is still, the Moon is high, the phase is right and you have all the gear, congratulations, now you can start acquiring your images! Planetary cameras are really just a chip so you’ll need to link it to a laptop with image acquisition software installed in order to capture your video. There are really only two applications I would recommend for this FireCapture and SharpCap. Both are free with FireCapture being the tool of choice for most planetary imagers as it offers the most functionality. I actually prefer the pared down SharpCap but really you should try both and see which one works best for you and your equipment, they are both free so you don't have to worry about cost. I won't go into all the ins and outs of how to use these applications as they both has very good help facilities and are pretty user friendly, I'l just cover some basic points I have found useful. It seems obvious but it is worth stressing how important good focus is, you can have everything in place and conditions may be perfect but if you haven't taken the time to focus properly you may as well have stayed indoors on a nice warm sofa. I find the best approach is to find a prominent feature and gently move the image in and out of focus until you find the sweet spot, you'll also need to bear in mind that the point of focus will change as the temperature changes throughout the night so you'll regularly have to re-focus for the best image. The point of focus will also change when imaging through different filters so you'll need to slightly change focus on each change from red to green to blue filter. SharpCap and FireCapture both offer tools that help with focusing and if you want a lower tech approach a Bahtinov mask is very helpful. As you are capturing a highly magnified image make sure it is in the centre of the frame of your video, it can take a little while to capture the frames you want if the frame rate is low and the last thing you want is for your target to drift out of shot. If you plan to stitch together a panorama consisting of a number of shots make sure there is plenty overlap in your frames, there's nothing worse than taking time to produce a panorama only to find when you try to process it you are missing a thin section from the middle. Generally I aim to shoot around a 2000 – 3000 frame video for later stacking, as the Moon is a bright object you can reduce the gain of your capture (think of it as ISO in a normal camera) which will reduce the noise in your image meaning the number of frames you need to stack (see later) to produce a low noise result will be quite low. As you reduce gain you will have to increase your exposure, but take care not to over expose your image. SharpCap has a handy feature called 'Highlight Over Exposed' which causes any overexposed parts of the image to flash, all you have to do is reduce the exposure or gain until this stops. You can also make use of the Histogram function within your acquisition software, you need to make sure the graph does not continue all the way to the right hand side, aim for 80% (see the image below). It is also worthwhile keeping an eye on the number of frames per second you are capturing, I would recommend around 30 fps as a minimum for Lunar imaging. You now have your precious .AVI or .SER file so the fun bit of creating your final image can begin. Image processing consists of stacking and sharpening the video you have acquired and to do this there are two fantastic applications that pretty much every lunar, solar and planetary imager uses, AutoStakkert!2 and Registax6. They also have the added bonus of being free. The whole stacking and sharpening workflow can be done using Registax, however I find that AutoStakkert does a better job of analysing and stacking so I use it for this and Registax solely for sharpening the image. The image below shows the initial screen you will be faced with in AutoStakkert once you have opened the video you wish to process. For lunar images make sure you have checked 'Surface', you will then see a green box appear, place this on the main area of interest in your image, if you want to make it larger click Alt-9, then click 'Analyse'. This will perform a rough alignment and order the frames of your video in order of quality. When analysis is complete a graph will appear which ranks quality against percentage of frames and also shows how much each frame differs, this will help you assess how many frames to stack. Once the video has been analysed you need to place the alignment points on the image. For lunar images I go for a relatively small size, 64 pixels in the example below, click on 'Place AP grid', this will place alignment points across the image. One point worth noting is that you shouldn't have any align points in the very dark area of the image such as the shadow within the crater Copernicus (below) as this will confuse the software and you won't get the best result. As you have shot your images with low gain you will not need a large number of frames to produce a smooth sharp result. In the example below I've only chosen the best 200 frames of a 2000 frame video to stack, but as the video was pretty noise free to begin with we can be very selective. With planetary imaging you would typically stack a much larger number of frames as your video will have been shot with a much higher gain and will be correspondingly much noisier. Now you need to sharpen your image, for this you are going to use Registax6. Open the stacked TIFF produced by AutoStakkert in Registax and you will be presented with the screen below. The wavelet sliders on the left hand side are what you will use to sharpen your image, with sliders 1 - 6 acting on progressively finer detail. If you have good quality data you will probably be able to get away with only adjusting slider one, as shown below. If you are too aggressive with the sharpening it will be very apparent so less is more in this, don't go for a super sharp image as this will look false and artifacts will be introduced. The degree of sharpening and noise reduction can also be controlled by adjusting the values in the boxes above each slider so it's worth experimenting with these also. If you are feeling brave have a go at checking the use linked wavelets box, for this you will definitely need to make use of the 'Denoise' boxes. The best thing is to experiment with the sliders as every image is different, but remember don't over sharpen. Once you are happy with the result click 'Do All' and then 'Save'. You're almost there, just some final tweaks to perform and you have your image. For final processing I use PhotoShop CC but you can also use free software such as GIMP for these actions as there is little you need to do to the image you have already processed via the steps described previously. Really there are only two things you need to do, crop your image and adjust the levels. Cropping is needed as stacking generally creates a ragged edge to your processed image, an artifact of the alignment process, so at the very least crop away the edges of the image to clean it up. For lunar images I also tend to lighten the mid tones via the levels layer. You can also change the aspect of your image by rotating it and create mosaics (remember to mosaic after cropping but before adjusting levels etc.). You shouldn't need to perform any further sharpening or noise reduction as this will have already been done. That's it you can now sit back and admire your handiwork! 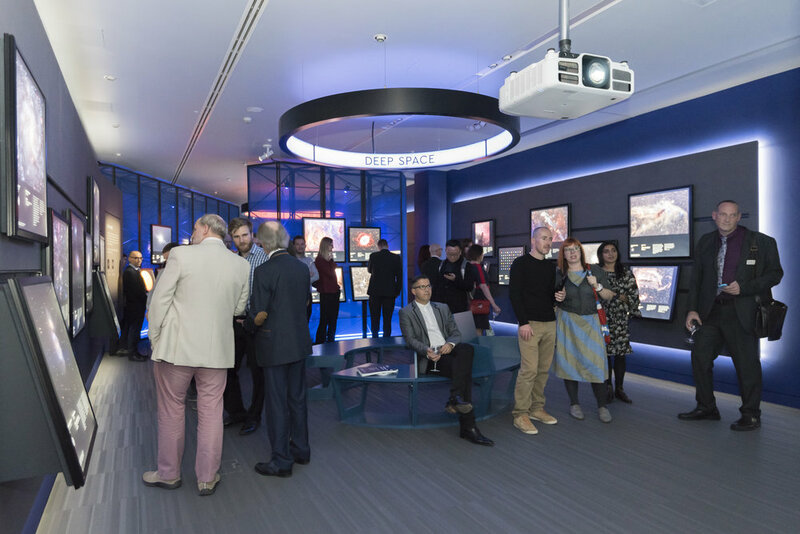 There are a few astronomical events that are sure-fire crowd pleasers, guaranteed to catch the attention of astronomers and the general public alike. Who can forget the Chelyabinsk meteor, or not be blown away by a beautiful display of aurora? The problem is it’s hard to predict when and where the next sizeable lump of space rock is going to burn up in our atmosphere and aurora, though more predictable, are in general confined to latitudes more northerly than those of the majority of the UK - certainly for the spectacular displays. A conjunction occurs when two astronomical bodies (two solar system objects, or one solar system object and a star) have the same right ascension when observed from Earth; this basically means that they appear close to each other in the sky. The key point here is that they appear close to one another, this is, as the title of this post suggests, merely a matter of perspective. Of course very rarely you can get conjunctions where this isn’t the case, comet C/2013 A1 Siding Spring and Mars not only appeared close in the telescope eyepiece in the second half of October 2014 but were also physically very close to one another (astronomically speaking), scarily so for any Martians out there! If the bodies have the same declination at the time of conjunction then the one that is closer to Earth will pass in front of the other and syzygy takes place. If a smaller body passes behind an apparently larger one this is an occultation, where the smaller body passes in front of the larger one this is a transit and when the transit or occultation is between the sun and the moon then this is an eclipse, simple. Of course now we can also detect transits outside our solar system, the transit method being an incredibly useful tool for the discovery of exoplanets, but let’s confine ourselves to events closer to home for now. No other astronomical event can rival a total solar eclipse for pure spectacle. It is a wonderful coincidence that the Moon is 400 times smaller than the sun but 400 times closer to the Earth (it varies hence annular eclipses which I’ll cover later). When alignment is favourable the new Moon passes directly in front of the sun from the point of view of an observer on the Earth’s surface causing the Moon to completely cover the Sun’s disc resulting in a total eclipse and the beautiful corona making up the Sun’s outer atmosphere being revealed. I can remember travelling to Cornwall in 1999 to witness a rare total eclipse visible from mainland UK, something I’d been looking forward to for years. Unfortunately as everyone in the UK knows totality was clouded out apart from a few lucky souls who managed to find themselves under a brief gap in the clouds. Despite the huge disappointment even the cloud diluted experience was totally unforgettable, sitting on a beach watching the sky darken and the birds roosting was totally surreal and an event I’ll remember for the rest of my life. The next total eclipse visible from the UK is in 2090, one I will certainly miss but maybe one for my kids. If you can’t wait that long, and didn’t make it to the States to witness the eclipse in August 2017 then make your way to Spain in August 2026, or witness a large partial from here in the UK. If you want to find out when the next eclipses are from your location or worldwide then www.timeanddate.com is a good resource. The closest I've come to witnessing a solar eclipse! Of course the Sun and the Moon don’t just provide total eclipses for us to enjoy. When the moon is at a point in its orbit where its apparent size is not large enough for it to cover the entire face of the Sun (apogee) an annular eclipse occurs in which the outer edge of the Sun is still visible creating the famous ‘ring of fire’. 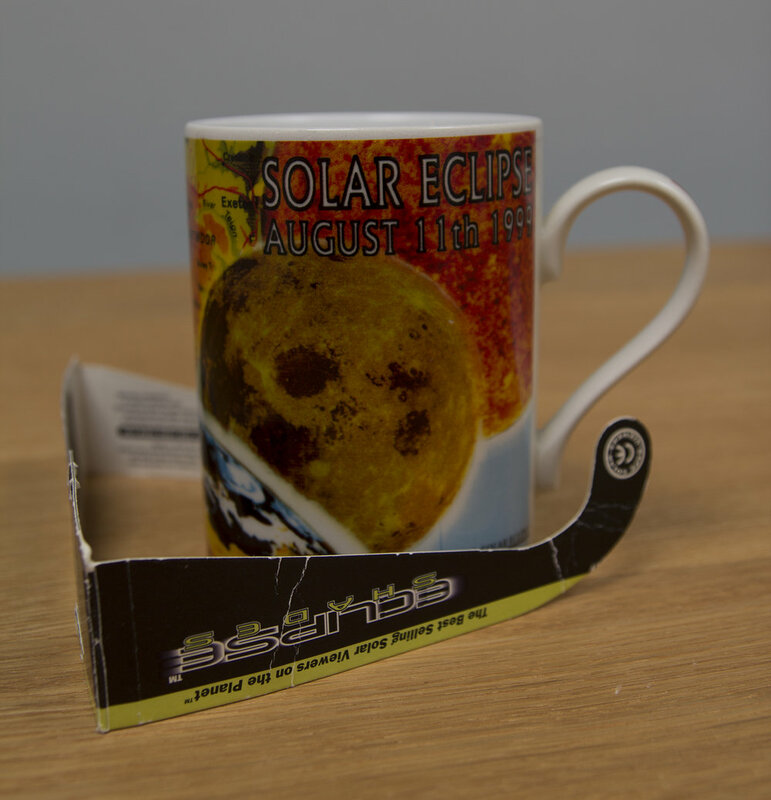 It’s a long wait for the next one of these visible from the UK but we can console ourselves with partial eclipses and here the odds are much more favourable. I have seen a few from the UK and listed those up to 2028 below. Of course the Moon also experiences eclipses, where the Earth passes in front of the Sun from the point of view of anyone fortunate enough to be standing on the lunar surface. These only occur on the night of a full moon and unlike solar eclipses are visible from anywhere in darkness with the moon above the horizon while the eclipse is taking place. Also as the Earth casts a much larger shadow than the moon lunar eclipses last for hours rather than the few minutes of totality experienced on Earth during a Solar eclipse. Lunar eclipses come in three forms, total, penumbral and partial. Total eclipses occur when the Moon is completely within the darkest (central) portion of the Earth’s shadow – the umbra. A penumbral eclipse occurs when the moon passes through the outer regions of the Earth’s shadow – the penumbra. This only partially blocks the Sun, resulting in the portion of the moon in shadow becoming slightly darker and can be quite subtle. A partial lunar eclipse occurs when part of the moon passes into the Earth’s umbra. At the point where the Moon is completely within the Earth’s umbra it takes on a reddish appearance due to the scattering of light by the Earth’s atmosphere, the same process that gives us our beautiful red sunrises and sunsets. Interestingly the more dust in the atmosphere the redder the Moon will appear. The last total lunar eclipse visible from the UK was in September 2015 when the sky was amazingly clear over London. Lunar eclipses visible from the UK over the next 10 years are listed below. Whenever considering transits it is usually the transit of Venus that immediately springs to mind. Transits of Venus loom large in scientific history and in terms of pure adventure surely nothing can compete with the first voyage of Captain James Cook whose aims were to observe the 1769 transit of Venus from Tahiti thus enabling the accurate measurement of the distance from the Earth to the Sun, and perhaps as an afterthought, confirm the existence of the land mass we now call Australia. Venus resembles a perfectly formed roaming sunspot as it transits, the fact that you are seeing a planet describing it’s orbit being played out before you in real time makes this an incredible event to witness. Transits of Venus are also precious for their rarity, consider the transit of 1631, if you missed that you only had 8 years to wait until the next one in 1639. Miss that however and it would be a 122 year wait until the next 8 year cycle in 1761/1769, odds then become more favourable if you miss these as there was ‘only’ a 105 year wait until the next in 1874, then another 122 year gap and so on. I’m sure many of you witnessed the transits in 2004 and 2012, unfortunately I didn’t (clouds) and fear I won’t be around for the next in 2117 regardless of the fact that it is one of the shorter gaps in the cycle! Not to be disheartened there is also the support act of transits of Mercury. Here the odds are much better owing to the fact that Mercury orbits much closer to the sun giving it a much shorter orbital period, tis means everything is played out in fast forward. There are roughly 13 to 14 transits of Mercury per century so there is always a good chance of seeing at least one in your lifetime. These transits occur in May or November with the last one occurring on May 9th 2016, luckily the skies cleared for a few hours enabling me to capture the images below. The next three transits will occur in November 2019, 2032 and 2039 before the next May transit in 2049. If you are impatient and transits of Mercury are still too rare for you then Jupiter comes to the rescue. The four Galilean moons, Io, Europa, Ganymede and Callisto regularly transit across the face of the planet, in fact you can also witness occultations and even eclipses where one moon may move in front of another. There are a number of web resources that are incredibly useful in planning when best to view Jovian transits such as www.calsky.com, planetarium software and the astronomy press. These events make a great imaging opportunity where the shadow of the moon, or moons cast a shadow on Jupiter’s cloud tops. You can also make a time-lapse showing the Galilean moons dance around the gas giant. If you want to observe an occultation then it’s best to aim your gaze towards Jupiter and its moons. As mentioned earlier an occultation of one of the main Galilean satellites by Jupiter is fairly common and easily observable with the equipment available to most amateur astronomers. You can plan your observing using the resources mentioned previously. Putting Jupiter to one side, when most people think an occultation it is the Moon that plays the part of the larger body and a planet, minor planet or star that is occulted. For a star to be occulted it needs to be close to the ecliptic with the bright stars Regulus, Spica, Antares and Aldebaran being in positions where the Moon may pass in front of them. The Moon may also occult The Beehive Cluster (M44) and The Pleiades (M45). An occultation of a planet however is what is really required to be considered a ‘crowd pleaser’. These occur surprisingly often from somewhere on the Earth’s surface, as both the Moon and the planets inhabit the area around the ecliptic and so come in to contact with one another on a regular basis. A great resource for occultation data is the USNO On-line Astronomical Almanac http://asa.usno.navy.mil/SecA/olist18.html well worth checking out to see if there is a notable event visible from your location, you can also keep an eye on the astronomy press.. Finally we have conjunctions, although you might consider them the poor relation of the occultation, a celestial near miss, they can be every bit as spectacular as any of the other events I’ve described and when a conjunction is between two bright planets it can stir up a fair bit of media interest. We also have the situation where one person’s occultation is another’s conjunction. An occultation by the Moon of Saturn for example will only visible from specific points on the Earth’s surface, but anyone near those points will have seen a conjunction of varying proximity depending their location. In the UK we’ve had some beautiful conjunctions to enjoy where the Moon has made a close pass of Venus, Mars, Saturn and even distant Uranus. As always with these events use the resources out there to make sure you don’t miss a great opportunity to witness or image a conjunction for yourself. All the events I’ve described, while no longer offering profound scientific insight still have the power to fuel the imagination and trigger a life long interest in the heavens, so get planning and make sure to persuade your friends and family to take the time to look up and enjoy the spectacle for themselves, you never know you might make a convert. The question I get asked more than anything else when the subject turns to astronomy is “How can you possibly do astronomy or astrophotography from London when there is so much light pollution?” Here I’ll attempt to answer that question as well as hopefully inspire others who live in or near a city (which is most of us) to give the wonderful hobby of astronomy a go. As you can see from the map below London is one of the most challenging places in Europe from which to view and image the night sky, so if I can do it anyone can! Whether because of work commitments, family ties or just financial reality most of us don’t have the option of moving to a dark sky site in order to pursue astronomy or astrophotography as a hobby, so what can you do to make the most of your light polluted urban location? Here are a few tips that might help, some are pretty obvious, but I think worth stating anyway. Make sure you are in shadow. Streetlights and neighbour’s bright lights are a universal problem in cities and towns, I’m constantly plagued by a kitchen light in neighbouring apartments that is so bright it illuminates the whole of my garden, I swear they must have to wear sunglasses to cook! I’ve planted some trees to obscure it but it will be a few years before they are going to be totally effective, so the best thing to do in these situations is try to set up in the shadow of a wall, tree or large bush, taking care that you can still see your intended target. If you can’t find that perfect spot then you could try channelling a Victorian photographer and cover your head with a dark cloth or coat. This will enable your eyes to become dark adapted (as long as it doesn’t slip off) and will help you tease out fainter details at the eyepiece. Shade your optics. If you can’t get yourself into shadow, or don’t fancy putting a hood over your head, try to shield your optics from stray light. Dew shields are a good option, you can either buy one or make one yourself, they serve the dual purpose of cutting out light and increasing the length of time your scope can sit outside before water condenses on your optics, extending the time you have for observation or photography. Image/observe when conditions are at their best. Pollution, dust and water vapour in the atmosphere all help to make light pollution worse as more light will be reflected back from all those streetlights etc. Poor conditions are generally found when humidity is high or it has been dry for a long period resulting in increased dust in the air. When you hear the term transparency this is usually what is being referred to, it’s also one of the reasons why observatories tend to be located in dry, lofty locations. For astronomy we also need stable conditions with low wind speeds, both at ground level and at the level of the jet stream. Astronomers call the variations in atmospheric conditions ‘seeing’ the better the ‘seeing’ the better the view you will have. A simple way of judging this is to gauge how much the stars are twinkling, shimmering stars may look pretty but they signify poor conditions for astronomy as they are the result of a turbulent atmosphere. Seeing is especially important for high resolution photography regardless of your location. I’ve included links to some useful websites at the end of this post which will help give you an idea of when conditions out under the stars will be at their best. Plan your observing in advance. Planning is key, from any location you will get the best views of a target when it is highest in the sky, this is even more important when observing or imaging from a city or town. By waiting until your target is at its highest you will minimise the amount of atmosphere you are looking through and lessen the impact of light pollution. There is also no point trying to view dim objects under a full Moon, make sure you know your Moon phases and plan accordingly. When the Moon is big and bright image and observe it rather than try to battle against it. Choose targets least affected by Light Pollution. A simple rule is that the brighter the object the less affected it will be by light pollution, pretty obvious really. Light pollution will have zero impact on lunar and solar observation and planetary observing and imaging is also pretty much unaffected, I’ve been able to view and photograph Neptune from my Wimbledon back garden. When observing and imaging planets atmospheric conditions are the limiting factor not stray light. Globular and open clusters are also a great option when observing under compromised skies but visual observation of galaxies and nebulae will be challenging, having said that big bright nebula like M42 the Orion nebula will still be visible under light polluted skies as will M31 the Andromeda Galaxy. Foster neighbourly relations. Security lights are great generators of unwanted light - it is after all their prime purpose! If you have them then make sure they are switched off when you are observing, if your neighbours have them get them over and introduce them to the wonders of the universe….then ask them if they could turn off their lights while you are indulging in your nocturnal hobby! Become a night owl. As the night wears on the amount of stray light decreases as people go to bed and switch off lights, also some local authorities switch off street lighting after midnight to save cash. The later you can do your observing the better. Speak to your local authority. If you have a street light that shines into your garden it may be worth while bringing this up with your local authority, if it shines into a bedroom even better as this will help you build a case for them to install shielding to reduce the amount of light falling on your property. A polite enquiry can work wonders sometimes. Escape to the country. I know these are supposed to be tips about making the most of your location but sometimes it’s nice to pack up and go somewhere truly dark – just to re-charge your astro batteries and remind yourself of what a truly dark sky can deliver. Of course as well as the ‘no cost’ options described above you can also throw science and money at the problem by employing filters. Filters specifically designed to reduce the effect of light pollution go by a number of different names, City Light Suppression (CLS), Anti-Light Pollution (ALP), Light Pollution Suppression (LPS), Ultra High Contrast (UHC) etc. They all work by tuning out the wavelengths emitted by common street lights and can make a big difference to both the eyepiece view and that obtained via imaging. There is however some bad news on the horizon in that the move to LED lighting by many local authorities will make light pollution filters less effective as they emit over a much broader spectrum. It is safe to say that there is a fair bit of debate about the effectiveness of these types of filters for visual astronomy but in my experience CLS filters are very effective when imaging from my London location making wide-field, long exposure DSLR shots viable. Have a look at the images below. Both were taken with the same exposure and while balance settings, the only difference being that the image on the right was taken with an Astronomik CLS filter in place. I haven't done any processing on either of the images so that a direct comparison can be made. The difference in the sky background in the image on the left and that on the right is obvious with the sky in the unfiltered image getting close to swamping out any detail while the filtered image on the right would benefit from a longer exposure. Both images could be improved significantly with processing, not least corrections in colour balance etc. A few points regarding light pollution filters are (I think) uncontroversial and worth listing. Filters work by subtracting (filtering out) particular wavelengths of light. This will make objects dimmer, but will, if the correct filter is used, improve contrast which will make faint nebula easier to see. By blocking out the wavelengths of light emitted by certain common artificial lights but allowing through the emission lines of the nebula you are viewing the sky will appear darker and the nebula brighter as contract will be improved. This also has the advantage of allowing longer exposure times for astrophotography as the sky background will take much longer to swamp the image of the object you are photographing. The effectiveness of light pollution filters varies depending on the object you are viewing. If you are viewing a source that emits across a broad range of wavelengths such as a galaxy or reflection nebula then the filter will not be as effective as when viewing an object that emits at a narrow wavelength, such as H-Alpha or Oiii for emission nebula. An urban location is definitely much more of a barrier to achieving good results for galaxies and reflection nebula, it may be that only a huge number of stacked un-filtered ‘short’ exposures will give you the result you crave! Light pollution filters will not block out all artificial light sources. They are not a substitute for truly dark skies. Filters will increase the time required to image an object. This may not be strictly true in all cases but in my experience it is certainly desirable to increase image times if possible. It is also worth noting that when imaging using light pollution suppression filters some colour shift will occur, some filters producing a more noticeable cast than others. This can however be easily remedied by creating a custom white balance for your camera with the filter in place. As with most things you get what you pay for, the limitations described above are less marked the higher up the price scale you go. Ultimately these filters let you make the most of your location, at least until you can afford that mountain top bolt hole. Why not throw even more money and science at the problem. A great solution for the astrophotographer is to image using narrowband filters, the most common being those that transmit the emission lines of H-Alpha, Oiii and Sii. With these three filters you can try to re-create the famous ‘Hubble palette’, utilised by the Hubble Space Telescope for many of its amazing images. These filters work really well on emission nebula, enabling you to image even very faint targets from an urban environment. They work by capturing very specific wavelengths of light, typically those dominant in star forming regions (Orion Nebula, Lagoon Nebula), and the gas emitted by exploding stars such as planetary nebula (Dumbbell nebula, Ring Nebula) and supernova remnants (Veil nebula, Crab Nebula). The bad news is that if you want to image the beautiful blue nebulosity around the Pleiades then narrowband filters do not work well, this nebulosity is lit by reflection from the nearby stars and so is a broadband source. Hydrogen-Alpha, H-Alpha (656.3nm) – This is most dominant in star forming regions such as the Orion Nebula. It is in the red part of the spectrum which is why on standard RGB colour images these types of nebula are red in colour. Oxygen-III, Oiii (500.7nm) – This emission line is in the blue green part of the spectrum and is dominant in planetary nebula, the Dumbbell nebula shows up incredibly well when this type of filter is used. Sulphur-II, Sii (672.4nm) – This emission line is well into the red part of the spectrum, it is generally weak and requires a lot of exposure time to generate a decent result. In bi-colour imaging this filter is typically left out but is included as you will want to use it if your desire is to faithfully re-create the Hubble palette. The positions of these emission lines is shown in the graph below. If you want to take pictures under light polluted skies but can’t afford, or don’t want to use filters there is another solution, stacking. The key drawback to imaging under light pollution is the fact that longer exposures cause the sky background to wash out or overwhelm the dimmer or more subtle objects and features that would be visible under less polluted skies. The solution is to keep your exposure times within the limit dictated by your sky brightness, you can work out what this is by taking a number of exposures of varying length and checking the image histogram or by visual assessment. When using the histogram you basically don’t want the peak of the graph to be right over to the right and you definitely don’t want to be touching the right hand edge of the graph as this indicates overexposure and total loss of data for that part of the image. Once you’ve established how long an exposure you can get away with take lots of short exposures that you can then stack (you’ll need a tracking mount and intervalometer). This increases the signal to noise ratio and will enable you to tease out faint detail in post processing, even under light polluted skies. The subject of image stacking and processing would require a book to cover properly and as this post isn’t about image processing I’ll leave the details of theory and work-flow to another time. If you do want to investigate this further there are plenty of resources out there on the web along with free software such as Deep Sky Stacker (DSS) which will do a lot of the hard work for you. All is not lost if you still want to image and process your own images of the night sky but don’t have the heart for the fight against light pollution. 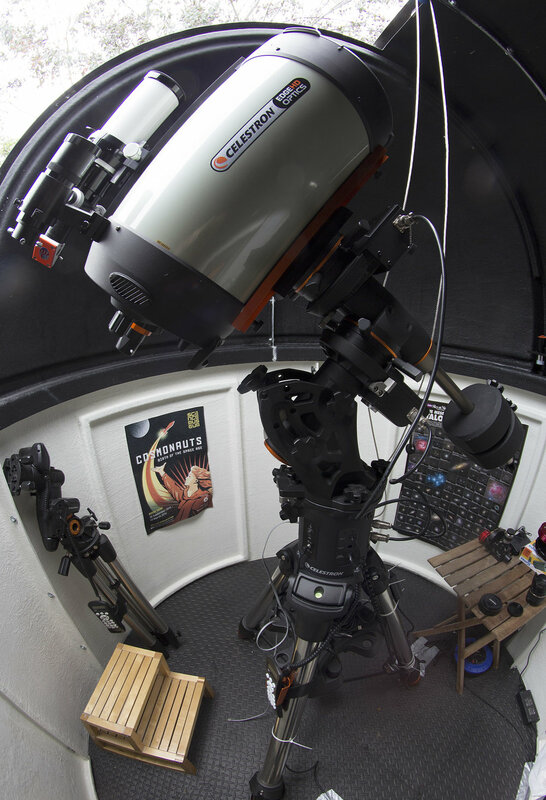 Robotic imaging offers you the chance to use amazing telescopes sited under some of the best skies on the planet, all from the comfort of your home. I wrote and article about it a few years ago which can be found here (it says written by Ralph, but it was actually me!). There are loads of astronomy applications out there but if you want something to get started with I would recommend Stellarium. I’ve found for planning it is best to use something on your desktop or laptop rather than phone or tablet, having said that there are lots of great apps available for your smartphone. I’ve found ‘Starwalk’ and‘Moon Globe’ particularly useful. On the 24th November I'll be back at the Royal Observatory in Greenwich participating in their now annual 'Evening of Astrophotography'. The evening consists of a planetarium show narrated by a well known comedian, last year it was Jon Culshaw who peppered his script with some brilliant impressions of Brian Cox, Patrick Moore and of course Tom Baker. This year the comedian Helen Keen does the honours, if you've ever listened to her BBC Radio 4 show 'It is Rocket Science' then you'll know we are in for a treat. 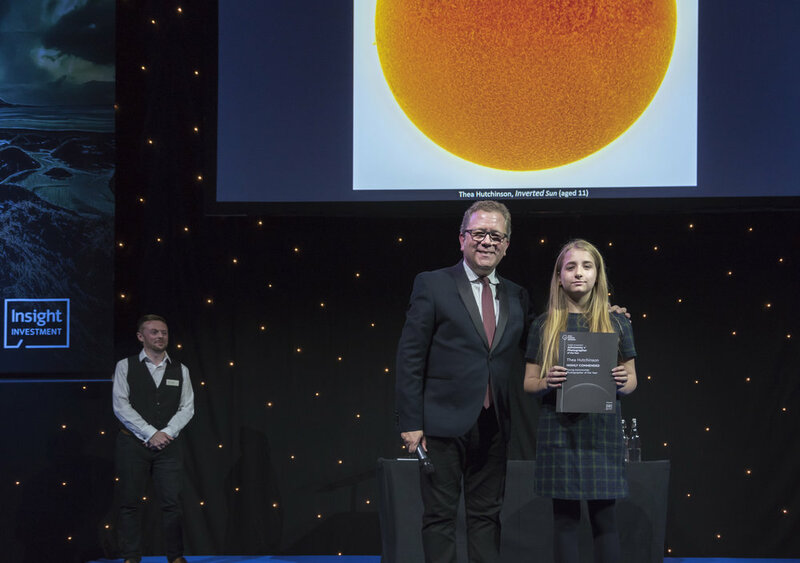 After the show there is a panel Q&A session which I shall be taking part in along with Will Gater, Melanie Vandenbrouk and Jamen Percy, then there are some workshops and an opportunity to re-fuel in the cafe and browse the galleries to see this years winning entries in Astronomy Photographer of the Year 2016. A great evening for anyone with an interest in astronomy/astrophotography in a historic location. Sometimes its fun when you have a high resolution Lunar mosaic to create a panoramic video, I love the impression it gives of floating above the lunar surface. To create this one I used some free software called 'Instapan' to render the panorama as a video on my phone. Hope you like the result! I have some high quality (350 gsm, silk finish) A3 size prints of the Flame and Horsehead nebula for sale. The image was taken in December 2014 and shortlisted in Astronomy Photographer of the Year 2015. I currently have 10 prints (as an initial 'test the water') and think they would look great framed or simply as they are. I've priced them at £10 + postage and packing, I'd estimate postage to be around £5 (overseas would have to be worked out on a case by case basis). If you are interested let me know via the 'Contact Me' page and I can answer any questions and provide my PayPal details if you still want to go ahead and purchase. The images were captured from southwest London in June and July 2014, the sunset time-lapse being shot over the course of around 45 minutes using a Canon EOS Rebel T3i camera and 300mm zoom lens. I can't remember what the interval was between shots, but it was probably in the order of around 15 seconds. The Moonrise was shot in July of the same year with the same set-up, intervals etc. The video was created in Photoshop and a soundtrack added. Star trail images are created by stacking a large number of individual shots taken from the same vantage point over the period of a few hours. You focus, set up the shot and let the intervalometer do all the work, easy. Once you have all your images you can load them into free software such as StarTrails or StarStax to create your final trail photo. Sometimes it is fun to generate a video from the images, you can either generate a time-lapse showing the stars circling around the pole star, or as in this example, ask StarStax to save an image after each action which enables you to capture the trail building up, you can then create a video from these images using PhotoShop or Windows Movie Maker. You can play around with the frame rate etc until you have something you are happy with. Good fun and a great way to make use of all those images! As Alice Cooper famously said School’s Out for Summer, so, as has recently become a family tradition, it was time to head off to rural France with my wife’s parents, her sisters and their families (8 adults & 7 kids!). Accommodating that many people usually means renting a large house, generally in the middle of nowhere, which has the benefit of beautiful dark skies but the downside of it being a long trek to the nearest bar! 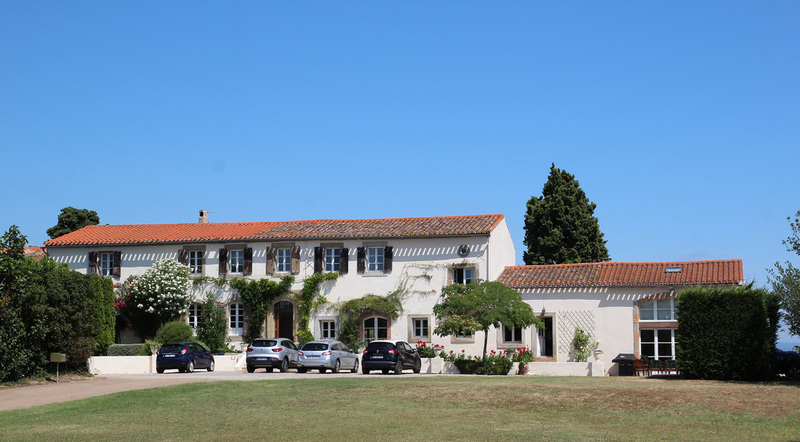 This year we stayed in a fantastic 8 bedroom farmhouse in Languedoc-Roussillon, about a mile from the village of Montreal and 7 miles from the medieval town of Carcassonne. Carcassonne is officially a city but really it is a large(ish) town, the most notable feature being the ancient walled city or citadel which sits on a hill overlooking the new town. This really is a must see and looks like something dreamt up by the ‘imagineers’ of Disney or the creators of the Harry Potter movies, think of a fairy-tale castle and you won’t be far off. I was surprised to hear that the citadel is France’s second most visited tourist spot, only the Eiffel Tower receiving more visitors! Outside the main tourist spots, Carcassonne is rather a sleepy place, there are some nice shops and restaurants and the Canal du Midi cuts through it, providing some pleasant breezes in the hot summer months, and an opportunity to float along on a boat or barge for a few hours. There is certainly enough to keep you busy for a few days and the town can serve as a base for exploring the surrounding region with its superb vineyards, beautiful villages and medieval castles. No town dwelling for us however, our farmhouse, Cascaret, sat on it’s own with harvested cornfields, sunflower fields in full bloom and vines all around it. We were lucky in that the weather forecast was set fair for the week, but the rigours of travel meant that I decided not to attempt any imaging on my first night in France. I did pop out to assess conditions and was pleased to see the Milky Way arching across the sky. The relative proximity of Carcassonne meant that there was a fair degree of light pollution to the east but in all other directions the sky was wonderfully dark. The baggage restrictions imposed by budget airlines meant that I limited myself to a pretty basic setup of a Canon EOS Rebel T3i DSLR, Samyang 8mm fish-eye lens, Tamron 17-50mm zoom lens, Vixen Polarie Star tracker and Manfrotto tripod, no scopes on this trip! After a bit of experimentation I came up with the suitably French idea of fashioning a ‘harness’ for the camera out of strips of cardboard taken from a croissant box and some sticky tape! It worked a treat, though was a bit of a pain as you had to reconstruct it each time you changed the camera battery (something you do pretty often when shooting long exposures or star trails). I could still get my astro photos, which, if I’m honest, is a huge part of the holiday for me, what a relief! I’ve popped a few of the results below and you can judge for yourself whether the efforts with the croissant box were worthwhile or not, also, when imaging in a cornfield in rural France at one in the morning make sure you wear something more substantial on you r feet than flip-flops! The results are in and the one on the left was the one that had been on the ISS with Tim Peake! Thought you might be interested in seeing how the rocket plants are doing 17 days after the photo in the previous post was taken. I think the one on the right may now be looking slightly healthier - though it isn't as advanced in growth. On the 2nd September 2015 two kilograms of rocket seeds (the peppery salad leaf) were blasted into space on a Soyuz 44S along with ESA astronaut Andreas Morgensen, Sergey Volkov of Roscosmos and Aidyn Aimbetov of the Kazakh Space Agency, arriving at the International Space Station two days later. On his arrival at the space station in December 2015 British astronaut Tim Peake took charge of the seeds as part of the Principia mission, the seeds then being returned to Earth with astronaut Scott Kelly in March 2016. Once back on Earth the seeds were distributed to all UK schools who had signed up for the RHS/UK Space Agency Rocket Science project, every school receiving 100 seeds that had been on the ISS, and 100 seeds that had remained on Earth. The seeds were provided in colour coded packets and the participating schools haven’t been told which have been on an adventure, for that we need to wait until the results have been analysed and published. It is hoped that the results of the experiment will enable us to learn more about how microgravity and the impact of cosmic radiation affects the growth mechanisms of seeds, ultimately contributing to the science of how to grow plants in space and possibly leading to the development of hardier varieties of food plants, more suited to the harsh environment beyond our home planet. My daughter’s school, Wimbledon High School, is participating in the experiment and she was fortunate enough to acquire some seedlings that were considered surplus to requirements. These have pride of place at home and are being given lots of TLC. You can see from the image above that there is a definite difference between the plants, the one on the left looking much more vigorous than the one on the right. As a little experiment myself I conducted a quick twitter poll to see which my followers thought had been in space. The results were interesting in that 77% of respondents thought that the plant on the left was the one that had left Earth, a little counter-intuitive, and probably reflects a bias for all things space among my twitter followers! I'll keep you updated on their progress and let you know which one was the 'space' rocket once results have been announced.